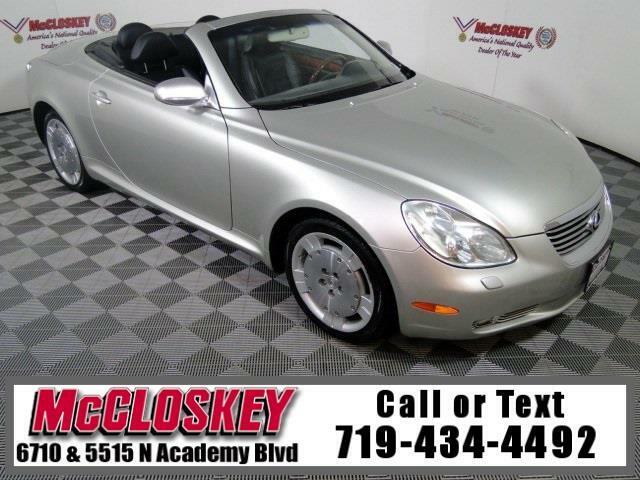 Pamper yourself in this 2004 Lexus SC 430 Convertible with Power Leather Seats, Premium Wheels, Impressive 4.3L V8 Engine, Cruise Control, CD Player, and Much More! Lexus builds just one version of the SC 430 that features the retractable hardtop, the 4.3-liter V8, the five-speed automatic transmission, and a long list of luxury features. The SC 430 comes trimmed in buttery leather with beautiful wood and chrome accents. Also standard is a navigation system and a Mark Levinson audio system with nine speakers. The SC 430 has a lavish cockpit with contoured bucket seats swathed in buttery-soft leather. The seats are very comfortable and adjust every which way. This vehicle passed our 110 multi-point inspection and is backed by our National Quality Dealer of the Year Award. We are an ''A+'' Better Business Bureau Rated Business. We offer low interest rate financing, low down payments and the highest trade allowances in the state! Here at McCloskey we do things a bit differently, we shop our competition every day to ensure a great value to you. Come on down and experience it for yourself. This McCloskey Assured vehicle includes a Vehicle History Report!! At McCloskey we strive to provide ASSURANCE, TRUST, VALUE AND QUALITY! Call 719-434-4492.